Tricky Triangles! 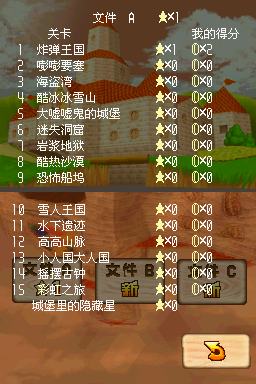 is the fifth mission of Rainbow Ride in Super Mario 64 and Super Mario 64 DS. Once the player reaches the four spinning platforms, they need to slide down the pole to the left. The player then has to use a tilting platform to reach another platform, followed by using a swinging platform to cross the gap. Then the player has to cross a series of Donut Blocks with a tilting platform between them, and jump across a gap while avoiding a flamethrower. Past the moving platform ahead is a gap with Donut Blocks across it, followed by a slight ramp and a few more Donut Blocks. After crossing these blocks is a large platform with a Purple Switch and triangle platforms. Pressing the switch will cause the triangles to flip upside-down, allowing the player to use them as platforms. The player needs to climb the platforms to reach the Power Star before the switch's timer runs out. The player must do this quickly, because the time limit is very short. French Vicieux triangles! Vicious triangles! Italian Triangoli traditori! Triangles traitors! This page was last edited on March 30, 2019, at 13:31.